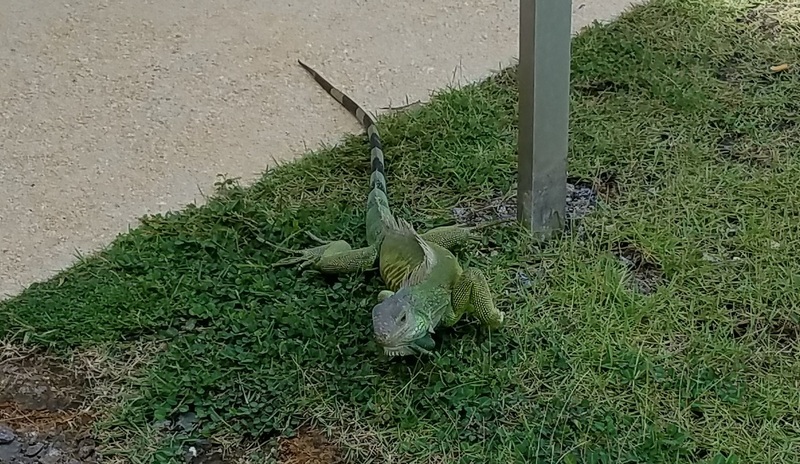 It was already Day Three of our Puerto Rico adventure and the beach, unsurprisingly, featured prominently. Our plan for the day was to walk around Old San Juan and see the fortresses. We knew there was a time limit to the activity because our children Molly and Michael are age six and five, respectively. Fortunately, one of the items in the condominium we rented was a stroller. We hit the beach for about an hour in the morning, repeating a pattern from our trip to Florida earlier in the year. While there, we went to the beach pretty much first thing in the morning and, as it turned out, the habit saved the day a couple of times. Amy and I pretty much let the kids establish the schedule. Because the sun set so much earlier in Puerto Rico than at home, the kids were generally in bed early and up at dawn. This schedule was key to the success of our trip, particularly when we moved on to Luquillo. That’s a story I’ll share in the coming weeks. Molly and Michael (and Bear) at the Parque del Indio. Our early days meant opportunities for more activity. After the beach we had a meal and headed out. We caught a special “tourism bus” near Parque del Indio. The bus seemed to operate exclusively between the beach areas and Old San Juan. It was a hot day and we were thankful for the comfortable, cool bus. I’ll underscore here that buses are the best way to get into Old San Juan. There is a long lane (Calle del Tren, “The Train Street”) running through San Juan that seemed for bus use only, and possibly only the public-run system. The tourism bus did not make use of the lane, but delivered us directly to Castillo de San Cristobal with little delay, and perhaps a little quicker than the public system because it wasn’t obliged to stop in the convention district. No description does justice to Castillo de San Cristobal. Considered for its original purpose, it intimidates, though in its modern context it’s simply a wonder. 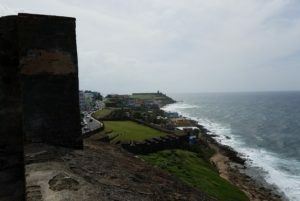 It towers above both the Atlantic Ocean and the old city, and in fact marks the border between the San Juan Historic District and the rest of the city. 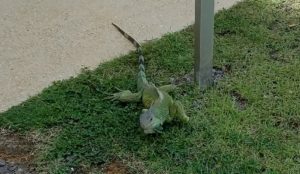 A friendly iguana greeted us at the gate for some light fun. “Friendly” might be stretching it; I don’t think it really cared we were there, but it was a cool moment and we enjoyed watching it forage for a couple of minutes. We took an elevator up and came out facing the east side of the fort that faces the modern parts of San Juan. 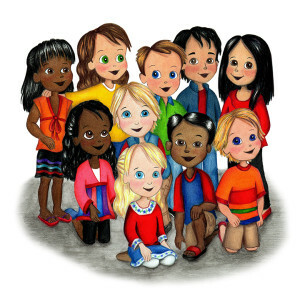 I was excited about it because one of Amy’s illustrations for Molly Goes to Puerto Rico depicted our characters there. I took several photos of Amy, Molly, and Michael checking the particular garita that was a prominent feature in the illustration. Scale view from the top of San Cristobal. Note my position in relation to the beach and street level. The fort was modified during World War II to be a lookout station for U-Boats. 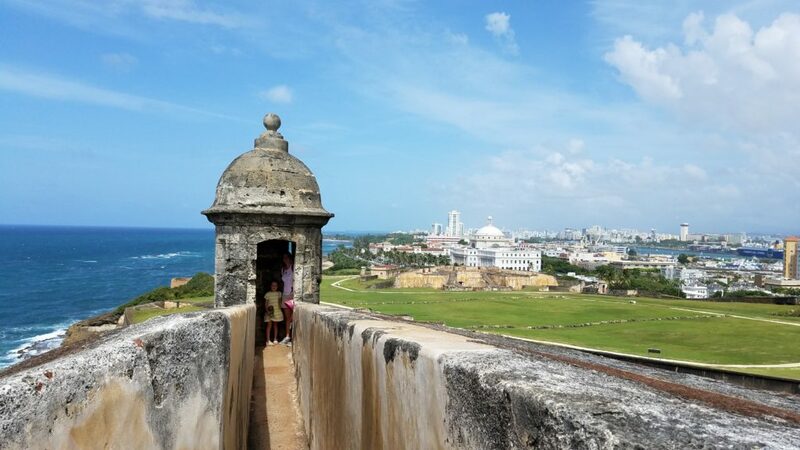 As you might imagine, these areas provide stunning views, especially turning west (photo) to take in the colorful architecture of Old San Juan, with another fortress, El Morro, providing the backdrop. It was a unique experience. Amy said over and over how the photos simply cannot show the majesty of it all. Look at a chart or map that shows the wind currents of the Atlantic Ocean. The “Trade Winds,” you will see, blow directly from Europe to Puerto Rico. It was simply the first stop in coming to the New World. You begin to understand the importance of Puerto Rico to Spain, and why these fortifications were built. Old San Juan is actually an island, one that sits astride the entrance to a natural harbor. It’s not difficult to imagine this as a key port not only for trade, but for repair and outfitting ships headed further west or south. As steam replaced sail, this first outpost became a little less visited, but for roughly 400 years, Puerto Rico was the gateway to the Americas. The view of the greater San Juan area from Castillo de San Cristobal. Molly and Amy are inside the garrita, the small turrets that are today a symbol of Old San Juan. Some writers do more than create stories, they create worlds. It doesn’t necessarily have to be separate from our reality, after all the world of Harry Potter exists here in secret. It’s always fascinating to see what writers do when they create something like this. Which brings us to Star Wars. More than a few writers gave a go at the Star Wars universe. Besides the screenwriters for the six films there was the unofficial/official trilogy from Timothy Zahn that launched more and more fiction. George Lucas had just one requirement: that all books take others into account when constructing storylines. You can see how the stories would become more and more constricted if you wanted to work with the principal characters from the movies. I read several of these books, including Zahn’s trilogy. There were some fascinating stories. Some of them simply continued the historical timeline and the struggle between the good guys and bad guys. Other stories, particularly those centered around Jedi themes, expanded some of the mythology of the pre-prequel Star Wars universe. Yet another storytelling format went back even further. Knights of the Old Republic, a computer game, introduced us to a new character who seems to have affected even some aspects of the upcoming film The Force Awakens. That character was Revan, the most notable Grey Jedi (neither light, nor dark) and one of the most powerful, at least in the timeline of the stories generally referred to as The Old Republic. I bring all this up because there was a lot of internet chatter on the nature of Luke Skywalker’s place in Star Wars: The Force Awakens. I haven’t read much of the speculation, but thought about it purely in terms of character development and also in context of what is revealed about Jedi in the six movies. Recall that the battle between Luke and Anakin was really two battles, each against temptation. One had to avoid succumbing to it, the other had to fight his way back from it. Both succeed, but at the cost of Anakin’s life. We see Luke twice after his father dies. First he creates a funeral pyre for Anakin. (It strikes me that this name could be “Any King” and the temptation of power as a theme is well-placed, if that was Lucas’ inspiration for the name. On that note, “Ana-kin” could be translated as “against family,” just a literary side note, I suppose.) Second, he celebrates with the other members of the Rebel Alliance. Here we already see his separation. He sees what others don’t, has a link to a continuity they don’t feel. Luke Skywalker off on his own, maybe a bit more Obi-Wan than Yoda in terms of isolation (he apparently takes R2-D2 with him), makes a lot of sense. Add to this that, thus far, Luke interacted with visions of Obi-Wan, Yoda, and his father. What are these three likely to advise Luke to do in terms of his power and the continuation of the Jedi? Luke has emotional entanglements. He is not a warrior monk as the prequel Jedi were. How were the Jedi wiped out? Because Anakin had an emotional connection. It’s sensible to suppose they advised Luke to get out of town. This discussion could go on for some time. There are other story-driven reasons I can think of for this part of the plot, but this is where we circle back to my original point: this movie, as the dozens of books it replaces, creates a new reality. It’s so much more than characters and settings with plot. There is an enormous backdrop to consider, political (suppose the reconstituted Senate of a new Republic exiled Skywalker) and sociological (people might blame the Jedi for the atrocities of the Empire, either for failing to protect them or because the “subtleties” of light/dark are lost on them) aspects come into play in stories this big. Tatooine? 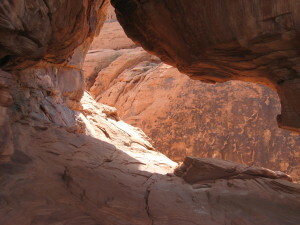 No, Valley of Fire State Park, Nevada. Just for the social media links. It is a daunting task to write in such a context, particularly with much of this universe created by other writers. This is one reason why Lawrence Kasdan’s presence and contribution with the new story makes me want to see it. It is also why I was so fascinated by the Old Republic storylines, mostly set forth in video games. I played these because I wanted to see what the writers (and here Drew Karpyshyn must be mentioned for his excellent work) did with existing mythology and how they added to it. There is a childhood factor at work here as well. Star Wars was one of the first movies I recall, and I saw it three times in the theater. In terms of hero mythology, the influence of Star Wars weighs heavily on my point of view. I likely will wait until after the weekend to see it, but I am anxious to see the creative choices. The Truce at Bakura, by Kathy Tyers: This picks up just hours after Return of the Jedi ends. There are interesting politics in this one in terms of Empire vs. a self-declared New Republic. A rather worn and weak Luke Skywalker encounters a spiritualism that holds Jedi accountable for the existence of evil. R2-D2 has a particularly direct effect in the resolution of this story. Heir to the Empire and The Thrawn Trilogy in general, by Timothy Zahn: Introduces one of the best characters in any part of the Star Wars universe, Mara Jade. Formerly known as “The Emperor’s Hand,” Mara’s destiny was to oversee the death of Luke Skywalker. I read this trilogy more than 20 years ago and can’t remember much, but there are some interesting connections to the Clone Wars here and the introduction of one of the most enduring and subtly-likable characters ever to head an Imperial fleet, Gilad Pellaeon. Children of the Jedi, by Barbara Hambly: Not sure I can explain this one. Basically, a ship with artificial intelligence captures a volatile crew (including Tusken Raiders) to aid its efforts at destroying a planet called Belsavis, where Han and Leia happen to be. Luke and a couple of his trainees are also captured, but become more and more cognizant of what is really happening. They must stop the ship before it reaches Belsavis with the help of a long dead Jedi. The Courtship of Princess Leia, by Dave Wolverton: this one was probably my favorite. A powerful matriarchal society offers the New Republic an alliance with the stipulation that Leia marries the heir to the throne (the current ruler had only a son). Leia’s love for Han is clouded by her duty to the Republic and Han goes a little nuts about it, winning a planet for her through some skillful gambling. Mild Spoilers: The planet, Dathomir, has a history, however, and when Han kidnaps Leia and takes her there, they find the Empire still mostly in charge. Luke arrives and is nearly killed by a group of force users that once defeated Yoda and a band of Jedi. Through this defeat, Luke comes to understand much more about the force and when he heals…well, that’s for the book to reveal. Most of this is on the back cover. The original question that inspired these creativity posts asked what books I recommended for the creative process. My answer is any book. There is no particular book I know on the process that is particularly helpful because my reading in this area is nonexistent. Still, any experience is of help. Sometimes we just need to hear the same thing said in a different way. Here are are my tips for finding that extra bit of creativity when needed. I consulted no other articles putting this together, but have read on this topic in the past and these suggestions likely echo others. What makes sense for one often makes sense for others. Most of our character creations to date! specifically, the chapter concerns a key figure in the story and his experiences. There is a direct relationship between the information and unraveling the mystery. None of it involves terrorism. In fact, it’s mainly about carpentry. How did the book inspire this? I’m not entirely certain. No similar chapter appears in the book. Nonetheless, the text engaged in a way where the thought processes used were similar to what was needed to create the idea. Logically, that is the best answer I can give. Reading stimulates our brains, and fiction in particular should spark the creative center. If it doesn’t, the author isn’t doing a good job. We constantly concoct visuals to go with the text. This is the reverse of how I write: my brain creates a visual and text is written that puts the same visual in the head of a reader. That’s the idea anyway. Different tools stimulate our brains in different ways. As an example, each night before studying in college I did the New York Times crossword. It took a couple of months to actually finish a full crossword, but complete or not the clues stimulated the analytical parts of my brain and made the reading much easier. Our classes were largely discussion based (small school), so breaking down large amounts of text into easy-to-explain summaries was the task at hand. It was a sort of game and the crossword gave the right mental nudge to do it. “Wait, but that’s exactly what I’m having trouble with!” Think of it as a lateral maneuver. Your mind won’t go where you want it to, so take it somewhere else and find another path to what you want. Write about something fun, or something you know. There is a scene in Finding Forrester, where Sean Connery plays a famous author, that rings true. He sits down to write while his protege sits across from him waiting for inspiration. “Start with something familiar,” Connery says and gives him an old essay. The younger man copies the first sentence and then he’s off on his own writing journey. Everyone writes a bit different and our experiences are unique. Maybe you love to compose poetry, but the project in front of you isn’t a poem. It doesn’t matter because, again, you access the right part of your mind. Once you wake up those brain cells, put them to work on what you really want to write. The results of my experience with this are mixed. I have a hard time writing about my hobbies and tend to lose focus on the intended message. Our experience with our interests is immersive; there is a lot of information stored in our heads! We have so much detail in our memories is not always easy to put aside that clutter and effectively communicate our experience. So it is sometimes a frustrating exercise to write about things we love. That said, the effort expended is not a waste. Part of the creativity we want to access is simply forming sentences and varying their structure. That is a worthwhile way to spend time. If you haven’t done this I hope you get the opportunity. It is too much fun to miss. new connections. It’s a good idea even if the storyline you want to write isn’t directly related (possible, but unlikely). This is an effective technique. First, it puts me more at ease with the book draft because it cleans up a few things. Second, it re-establishes the pace of the narrative. The mental energy that goes along with being part of that pace opens up the story. Once again, we’re immersed in the feel of the book. If you pair this with the fourth tip, it should give you somewhere to go. You made an outline, right? Okay, go back and take a look. Remember the arc you envisioned when all this started. It sounds a little odd, I mean, you might have the outline pinned to the wall and think you constantly access it. But we can and do lose focus. My chapter book mystery The Shield of Horatius is set, mainly, in modern Rome and the characters visit some amazing sites. There is a mighty temptation to drone on about the surroundings. We put together likable characters that interact in interesting ways and…maybe…we overdo it. We fall in love with the dialogue and forget to serve the story even while we think we’re serving the art. The art, however, isn’t writing, it is storytelling. Witty banter between characters only does so much for the book. Consult your outline. Get back on track with the story. Mind maps and other idea-generating practices also might be useful. I use and recommend these for essays, but never had a need for them when it comes to writing narrative fiction. No matter what anyone suggests, when you make the effort you likely will find something that suits you. As I said, our writing and our experiences all differ. It stands to reason there is no true model to produce a creative spark in every single one of us. Good luck with your writing and thanks for reading! Let’s take a moment. I know this doesn’t need to be said, but here it is: everyone’s approach to creativity is different. That said, I talked to a friend today who also writes and consults in marketing about his approach to the process. It was basically the same as mine. The end dictates everything that happens. Because this is true, you have to start with the end. 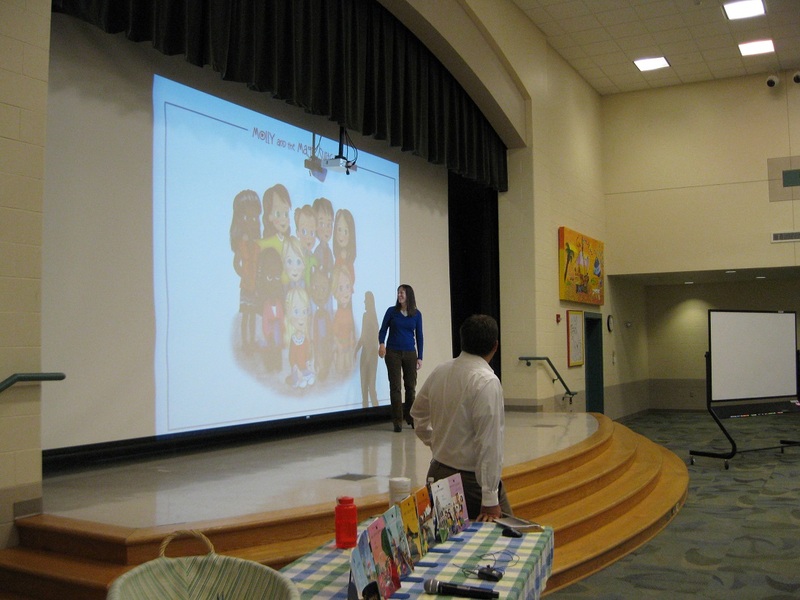 Story arc is something I always cover when we speak at elementary schools. 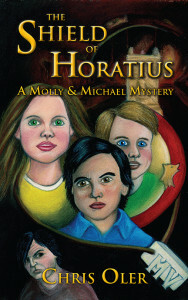 It’s an easy thing with the illustrated series because the stories start and end at Molly and Michael’s house. There are many other elements we present, but the story itself ends where it begins, with knowledge gained. It is, naturally, different with a longer story and the example genre here is a mystery. There is a sought outcome that may or many not involve location, but has everything to do with knowledge. The knowledge may be a location, or who did it–basically, the resolution of the main conflict. Items must be found, secrets uncovered, clues understood, trials faced, shortcomings overcome, and villains defeated. Some of it happens along the way. The story’s goal must be clear, both to writer and, eventually, reader. Everything in your story arc must serve the story resolution. 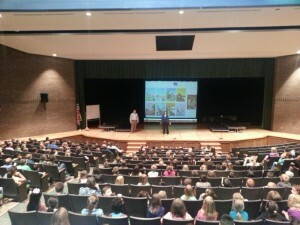 At our most recent school talk. You have to know the end before you begin. If you do not, there is nothing to direct where the story goes. Obscure the end, make it uncertain to the reader, but be certain for the purpose of writing. The Shield of Horatius is a story about a lost artifact. That was the resolution I sought. So…where do I start? It’s much easier to see the process in hindsight. I introduced the story of the artifact, its user, its protector, and then its finders (while also revealing the reason for their journey). It is a four-and-a-half page introduction that spans 2,500 years. It’s not a dry introduction, the first two segments take place in the heat of battle. Actually, I didn’t write the first segment, it is quoted from the Roman historian Livy. The second segment is historical fabrication on my part, though it takes place during events that are part of the historical record. The third part (re)introduces two of the main characters. There was an end, now there is a beginning. How do we go from Point A to Point B? There must be points along the way. We move, within the story, in increments that inform, shock, frighten, endear, or produce any other effect we want to have on the reader. The goal is twofold: move toward the end and keep the reader interested. It is at this point that you stop looking at the whole process as “creative.” Why? Because you’re filling gaps, doing things that make sense, creating the necessary events to lead to a plausible and exciting conclusion. You’re creative at every turn–varying sentence structure, using vivid language, revealing character–but it doesn’t seem so. For the writer, it’s a straight line from beginning to end, though the story may (and should) include twists and turns. That is why creative process, in this context, is difficult to describe. There is no ritual I can give someone to think creatively. When you have the end and know where to start, the rest reveals itself. It doesn’t have the feel of creation, it is just storytelling. The thing is, and this is difficult to remember, the story only exists inside of you. No one else knows even if it is something that in your mind seems so clear. And it is clear, or will be when things are going well. Things line up, twists pop to mind, the story pours out of you…when things go well. When things don’t go well, there are a few things that help and we’ll discuss those next time. We started a discussion on creativity and reality intervened. A good reality: we released a new book. Even better for this post, I had the opportunity to discuss creative processes with my wife, Amy Houston Oler. She is a designer and illustrator, which you may know. A moment of dual inspiration led to Molly and the Magic Suitcase. As we packed for a trip to Florida, our daughter crawled into my suitcase. She made a scooting motion as if she expected the suitcase to take her somewhere. I said, “Look! It’s Molly and her magic suitcase!” and snapped a photo. Amy immediately seized on my offhand remark as a concept for children’s stories. What does this mean? It means, first of all, you have to be open to creation. Amy wanted to illustrate a children’s book since age ten. I gave it some thought years ago when a friend and I tried to develop a concept called “Dickie Matrix.” You may hear about that some day. Otherwise, I hadn’t thought about it, and wasn’t thinking about it in that moment. Being open to creation means you recognize moments like this for what they are or what they can be. You must recognize opportunity when it presents itself. That is easier said than done. We all have experiences where, in hindsight, we missed the signal. Sometimes it is obvious, but not often. Other times, it hits you subconsciously. Three or four times in my life, I had dreams that were fully scripted movies or plays. I didn’t write anything down. The dreams were interesting to me, but I didn’t recognize the opportunity to create. This map appears in The Shield of Horatius. These are key locations for the story. Inspiration, more often, is subtle. You sit in a coffee shop and idly wonder about a group of three people discussing something at a nearby table. You see a road that disappears over a hill and consider what is on the other side. A headline conjures images in your head that may or may not have anything to do with the story. You read a passage in a story that stirs curiosity because its information is incomplete. Yitzhak Rabin and Yasser Arafat signed a “Declaration of Principles” that was to govern negotiations between Israel and the (then) Palestinian Liberation Organization. It was an unlikely breakthrough. I was in college at the time, studying political science. Several news stories referred to “secret negotiations in Norway,” but nothing elaborated on it. It stirred my curiosity. So much so that I researched and wrote a 20 page paper on what happened. It was simple: there was a question that needed an answer. There was a story to tell. It was a story something inside of me had to tell. I grew up reading mysteries (and comic books). After we finished the first two books in the Molly and the Magic Suitcase series, it was time to try something new. We wanted to reach older readers, but use some of the same elements: introducing language, food, and different aspects of culture. It was a simple concept to flesh out. I aged the characters and led them back to a destination they previously visited. I had the setting, the characters, and the idea it would be a mystery. The setting, of course, was Rome. There is history on every corner, and, quite literally, in every wall. For example, today there is a restaurant on the Aventine Hill, just west of the Circus Maximus. Part of its walls are the ruins of an old Roman temple. I wanted to incorporate things like this, wanted to tie the history of the city into the mystery. It wasn’t a creative decision for me, it just made sense. When you have a concept, creativity often feels like common sense. The next step was a simple Google search: “legends of Rome.” This led me to Publius Horatius Cocles, the famed defender of a bridge. It was a modern day mystery so I made the story a lost artifact. The survival of any shield from that era (508 BC) is much less than likely, but I had the concept, and at least two questions that needed answering: where is the artifact now and how did it survive to present day? This was the story I had to tell. A hundred more questions arose and were answered. How did the kids’ friend connect with the concept? Why do Molly and Michael get involved? How did the shield survive the first sacking of Rome in 390 BC? What about the subsequent sackings? What were the antagonist’s motivations? I knew the right questions were asked because I had fun doing the historical research to come up with believable answers. The key is recognition of creative opportunities. Many writers and songwriters keep a journal close at all times. They expect inspiration at any time. My approach to The Shield of Horatius was much more structured because some of the parameters were already set. The second mystery is a work currently in progress, and I sometimes wonder if the concept wasn’t somewhat forced. Still, I’ve written close to half the book and my editor eagerly awaits more (not because of a deadline). Perhaps I need to take my own advice and recognize the opportunity. This is just the first step. By no means does it represent the total creativity needed for the book. Each sentence requires it, but, first, you need a story to tell! “Be creative.” This likely conjures different thoughts and meanings depending on your interests or work. There are different creative aspects to what I do now and that is what this post discusses. 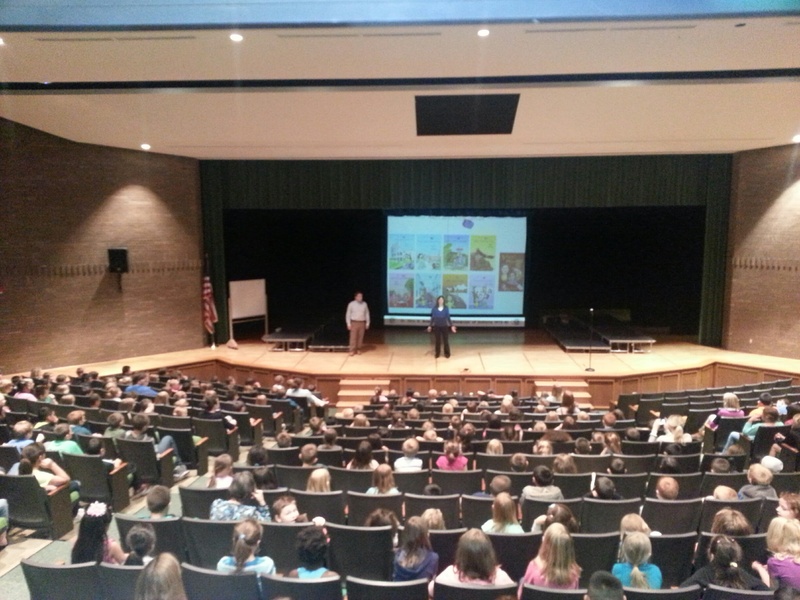 It is the creativity associated with writing a book series, as well as marketing work. First, however, let’s consider what “creative” means. The word is sometimes used as a noun. This is true in marketing and advertising firms. A creative is someone who works either in design (whether graphic or web design) or produces content. Ten years ago, the latter would simply be known as a copywriter. Today, however, video production is more integrated into blogs and websites, so the definition must expand to include the person who develops these visuals, as well as the person that writes the script. My work entails some of these things, but it didn’t always. Before I was a “creative,” when the term was mentioned, the thought that came to mind was of someone who created something out of nothing. Sometimes it was true. Now things are different. We don’t create ad campaigns based on creativity, at least not if we’re smart about our approach. Any sort of campaign should be an extension of a company’s personality or culture. This has been the advisable direction of content creation for at least five years, and some companies make good use of it. 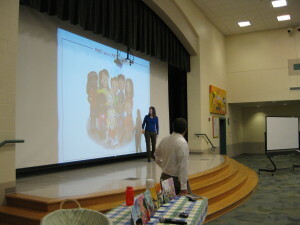 Our most recent school talk, sharing the characters we created for the first nine books. There was another image of a creative person, in the agency context. It was someone who wasn’t particularly professional or organized. One might say rebellious, but indulged may be a better description. Indulged, that is, if they did a good job of being creative. And again, from the outside, that appeared to be some sort of magic. There are creative people in all walks of life and work. Some solve internal problems in a new way, others see possibilities in new markets (or new possibilities in old markets), and a good number figure out the next big thing in terms of products or machine tooling, etc.. Teachers are creative on a daily basis, tailoring lesson plans for students with different learning styles or challenges. A retail salesperson is creative in how he or she interacts with people, because no two customers are exactly the same. A book author is creative in finding a new story to tell. This is the work I can discuss. Some of my experiences apply to the other areas, but this is a writer’s blog. Someone asked recently what books I recommended for the creative process. I have no recommendations. Well…that’s not true. Any book can inspire creativity. “NO,” you shout, “that isn’t what I came to learn. How do you get creative?” In other words, what steps can I follow to be more creative with writing, or have an easy flow of ideas? It starts with capability. What resources can you call on? How much experience do you have writing? How many hours have you put into it? How much have you read? Have you read different types of books? How familiar are you with writing styles? Literary devices? How varied is your vocabulary? All of these things give you choices; choices in narrative, in sentence structure, and much more. Writing fiction is more than telling a story. It needs to be told in a way that is effective for the audience you want to reach. That is my perspective. A writer can be as artistic as they want, but in the end if you fail to communicate the story to an audience, then all you accomplished is expression. When no one receives your message or is able to form another interpretation, then what good is a story? That is why having choices in how you write is necessary. Writing creativity starts with capability. That is the beginning. Give some thought to your own capabilities and how you might improve them. I can identify particular experiences that improved mine: writing hundreds of letters and several speeches when I worked in politics, learning Greek and Latin roots while teaching them to 8th and 9th graders, and instructing the same students in literary analysis. Some people say you need to live before you can write something of consequence. If it is experience you need, it is experience with writing. It comes both through hours of reading and composing. This is pretty general, but it’s already run long. We’ll discuss the creative process in the next post and it will be here soon. Thanks for reading!